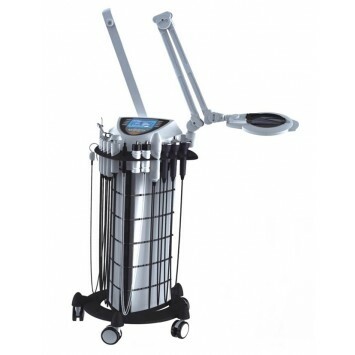 Vacuum - Allows a deep cleansing of the skin, brings skins impurities to the surface, aiding in easy extractions. Benefits: Deep pore cleansing of the skin. Spray - Cools and Soothes the skin. Aiding in absorption into the dermis. Benefits: Aids products into skin, providing deep moisture and product benefits. High Frequency - Stimulates circulation of the blood, increases glandular activity, aids in elimination and absorption, increase metabolism, germicidal action, generates heat inside the tissue and aids in deeper penetration of products into the skin. Benefits: To aid in the treatment of acne, kills bacteria and possible skin infections. Facial Brush - Rotating brushing system, includes a variety of attachments for different purposes. Lightweight for easy to handle, quiet and convenient for shaft hook-up to allow easy access. Benefits: Relax and enjoy the soft massage while the brush deep cleanses into pores to remove any dirt and debris. Magnifying Lamp - Magnifying lamp consists of optical lens and soft light of cold lamp tube. It can make observation cleaner, so acne and dark spots are more easily to be found. It is very suitable treatments and skin analysis. Facial Ozone Steamer - Moistens and cleanses skin. Steam causes pores to expand and stimulates blood circulation. Comes with an adjustable extension arm that will allow a broader facial steam. Unit Includes a timer, and Alarm Settings. Benefits: Moisten and cleanses the skin. Steam causes pores to expand and stimulates blood circulation. The ozone variety of steam is also capable of increasing cell oxygenation. Galvanic/Microcurrent - applies the principle of negative and positive current pulling. Cooperating with nutritional solution of anion and Cat-ion to introduce nutrition into skin and harmonize skin degree of acid and alkali. And also to accelerate blood circulation. Benefits: Utilizes sonic vibrations to reduce lines, leaving the skin firm and smooth. Features intensity control.s. Ultrasonic: Acoustic vibrations which stimulate the skin tissue and improves cell membrane and causes collagen regeneration. Reduces wrinkles and fine lines that for younger looking and feeling skin. 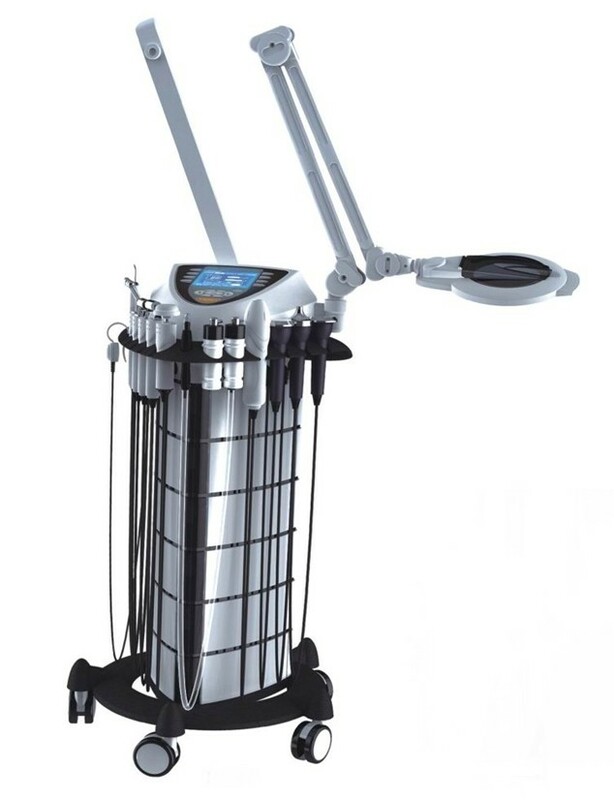 Ultrasonic also generates frictional heat which accelerates blood circulation and helps muscles to relax and decompose cellulite and deeper product penetration into the skin.